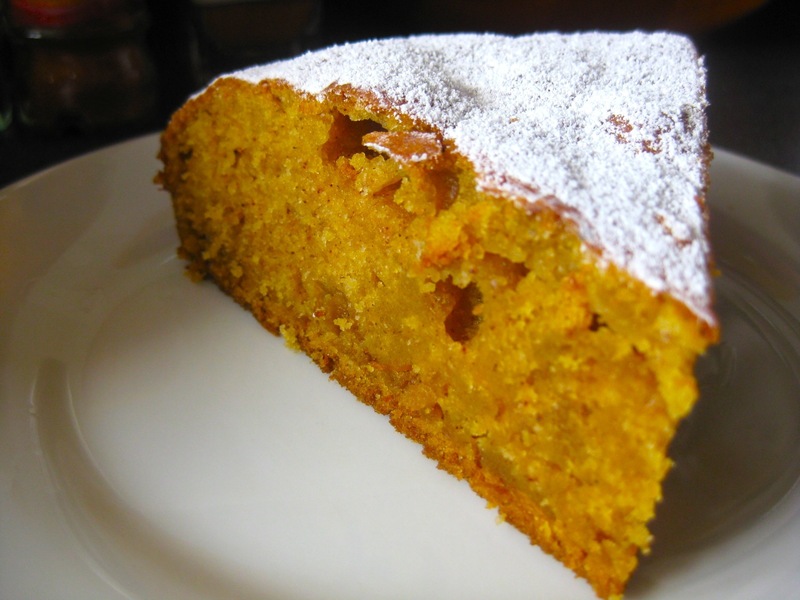 What banana bread is to winter, pumpkin cake is to fall. Leaving SAT analogies aside, this is simply the quintessential fall cake to make. As the autumn leaves turn a beautiful range of orange-brown colors and people start buying pumpkins for Halloween, the time has come to switch from the summer peach, pear and plum desserts and introduce pumpkin into one’s menu. Pumpkins are native of North America and are rich in vitamins, minerals and fiber. As its orange color suggests, pumpkin is a good source of vitamin A and its precursor beta-carotene, which is necessary for vision, skin repair and other important physiological functions. In addition, consuming pumpkin may lower one’s cholesterol and be an excellent dietary option for people with diabetes. The seeds of pumpkin as well as the oil extracted from the seeds might have additional health benefits, such as reducing the risk of cancer and prostate disease, and are also known to have antimicrobial properties. Preheat oven to 350°F/180°C. Sift together the flour, salt, sugar, and baking soda. Mix the pumpkin, oil, eggs, 1/4 cup of water, and spices together, then combine with the dry ingredients, but do not overmix. Pour into a buttered 9x5x3 inch loaf pan (23x13x7 cm) or 9-inch (23-cm) round pan. Bake around 30 minutes or until a wooden toothpick poked in the very center of the loaf comes out clean. Turn out of the pan and let cool on a rack. * To make pumpkin purée, cut a pumpkin in half, scoop out the seeds, lie face down on a baking sheet. Bake at 350°F/180°C until soft, about 45 min-1h. Cool, scoop out the flesh. You can also boil pumpkin cut into several pieces, peel and then mash. Baking will bring out its flavor more and the purée will be less watery. If boiling the pumpkin, skip the addition of water step above.